for children, with a career that brings a special wisdom, covering both traditional print & digital publishing opportunities. I have had more than thirty-five children’s picture books published, and have co-developed two apps, with several more on the way. In this blog, I will discuss the creation, marketing, publishing industry concerns, and other aspects of app development from the point of view of a children’s book author/illustrator… what I’ve learned. As a creator of children’s books, apps are just about the most fun, and industry-changing career-enhancing thing to come along in my lifetime. Now the big debate is the future of print books. There will always be physical books around, but, as I said in an NPR interview in early 2012, in one generation – maybe 30 years – the average household will not have a bookshelf. Books will be bought by collectors, like fine prints, and also be housed in libraries and institutions. As many folks in the app industry have said, you need a good story for an app, just as you do for a book. Not all children’s books, however, wonderful though they may be in print, make good apps. Just because you can, doesn’t mean you should: studies have shown that putting in all the bells and whistles often detracts from the story, from reading, and from comprehension. Books that work well as apps have a sort of natural interactivity inherent in the concept. I don’t do classic fiction, or “stories.” I generally do nonfiction concept books that lend themselves well to apps: maze, alphabet, seek-and-find, counting, and lift-the-flap books. In late 2010 I was approached by Omar Curiëre, who had written me a “fan” letter about my maze books a few years earlier on behalf of his then-6 year old son. He owns a graphics company in the Netherlands (OC Graphics, virtual reality video creation work for architects, real estate firms, city planners, etc). A creative man, he saw the future; he wanted to get into apps. He thought my maze books would be perfect. I was thrilled, and ready to embrace new technology…it seemed to us then, and now, that the interactive concepts inherent in my books, and even my art style (I draw with black lines, which are easier to animate than a more “painterly” look), would be ideal. He created a new division of his company called OCG Studios. All five of my maze books were still in print, and we didn’t want to license them, so I developed an original maze idea. We discussed it back and forth via email, I created a rough outline of the concept, and traveled to Amsterdam for a 3-day brainstorming session. Over the next six months, I made a huge maze illustration (5ft x 3.5 ft), did 400 spots (for animation, use as fonts, things to find, etc), and scanned and uploaded the assets to OCG Studios. They developed the app as I finished the art. It was, in terms of idea and execution, a joint creative project, and we worked in great harmony. “Roxie’s a-MAZE-ing Vacation Adventure” (for the iPad, iPhone/iTouch) came out in April 2011. It is a game for up to five players, with random maze interactivity, original commissioned music, sounds, animations, many thing to search for, count, and name. It’s basically wordless; language is not an issue, so it sells all over the world, and is consistently ranked in 55 to70 app stores. We are now working on a series of apps designed to educate and interact in the school, library, or home environment with a new book product, K.I.W.i.StoryBooks (Kids Interactive Walk-in Story Books), coming out later this month. To make it easier and less expensive for children’s book authors and illustrators (and others), OCG Studios has developed a cool system, a framework, called DYO (Develop Your Own)– it has a menu to choose from (how many screens, how many animations per screen, narrations, etc), and OCG Studios builds the app with the client, based upon their budget and how much they can contribute themselves. The developer accepts your app proposal, builds and markets the app, and pays you a royalty. This is uncommon for authors/illustrators; most developers are doing licensed properties, fairy tales, or “zombie” (out-of-copyright) works. If you have a book in print with a publishing house, the publisher pays development costs, markets it, and pays you a royalty (current industry standards: 25% of net or 15% of retail). You share the costs and marketing with your book publisher and decide upon a percentage to each. Royalties shared. You share the costs and marketing with the developer and decide upon a percentage to each. Royalties shared. You pay the developer and you own and market the app. You get all royalties. As many of you know, the App Store takes 30%, which leaves 70% to be distributed between publisher or developer, author/illustrator, etc. If you are an author/illustrator you can do original work for an app (like my Maze app). If your book is in print, you can work with the publisher in various ways, as discussed above, including licensing your own book back from them. If your book is OP (out-of-print, like my Doors book), you either have or can get the rights (check your contract; usually 6 months after it goes OP). Also ask for the scans (sometimes there is a clause in your contract that mentions this). Often you have to pay the publisher for them. 3. Although most mainstream children’s book publishers have at least a fledgling digital program, they are still reluctant to whole-heartedly embrace apps, primarily because of difficulties in marketing, device/platform issues, and the pricing model. As creative folks, many of us don’t particularly like marketing, but it is critical. You cannot market apps the way children’s books are marketed. Children’s book industry print review journals, like School Library Journal, Booklist, Kirkus, Publishers Weekly, and the Horn Book are excellent for getting your print book bought by schools and libraries, but they have few app reviews, and little impact upon app sales (although more and more libraries and schools are buying digital devices; in counties in some states, like Georgia, New Hampshire, and California, the library book budget is being spent on iPads). There are many devices and platforms out there right now. Developers have to remake apps to adapt to different devices. For example, an iPad app will not play on a Kindle Fire device, and vica-versa. So building an app for multiple platforms and devices is time-consuming and pricey. App developers/publishers have to search out each household that owns a device (iPad, Kindle Fire, etc), and get them to read a review, and download the app. The same marketing rules for print do not apply to digital media. There is no Barnes & Noble, or independent bookstore, for the customer to browse through. Discovery, in the App Store for example, is pathetic. They don’t have keywords, so you usually have to pretty much know the exact title. And as so many on this forum have said, the pricing model of apps vs ebooks is illogical (ebooks, cheap to make, cost up to $15 and more; apps, expensive to make, have a ceiling of maybe $4.99). However, right now there’s not a lot we can do about it. So, it is unlikely you will become a millionaire. Most developers that you pay to create your app do not market it, unless there is a profit-sharing agreement. You need to hire a marketing person, or work pretty much full time on it for months. You can sell to dozens of countries – many more than a print book. Internet reviews are available to everyone, and theoretically can reach many many more people than print reviews. Fulfillment is not a problem, unlike physical books, which have time lags and major expenses in reprinting, shipping, storing in warehouses, etc. Print books are complex and take time to reissue and rewrite or edit; apps are easy to update, and are immediately available to purchasers. When you submit to the App store, you get 50 free promo codes (apps) to send to reviewers. With each update, you get 50 more, so sending your app out for review, all over the world, is much easier and cheaper than print books. 5. If you are an illustrator (or writer) and want to create an app, use a professional developer. It is worth the money. Although you may have a techy friend (and there are do-it-yourself programs available), you will not get the cutting-edge technology and respect in the industry that you will with a developer. And you need to share the same vision. Everything can be done via email, so using a developer across the country, or across the ocean, is not a problem. Upgrade your own devices (including scanners, for animation spots) when necessary. Make an agreement in which everything is clear (financial, copyright, who owns the coding, who does the marketing, updates, various responsibilities). The developer can place it in the app stores, and will do the necessary bug fixes and periodic updates. All assets – art, sounds, music, narration – must be of the highest quality. It is very competitive out there, and poor design or outdated technology is immediately obvious. Besides reading professional reviews, pay attention to what the purchasers of your app say in app store reviews and customer support issues. They often have good ideas that you may be able to incorporate in updates. 6. It is great fun, really quite thrilling, to see your work come alive as an app. It isn’t “better” than a print book, but it is different. Telling your story, or creating a cool concept, across multi-platforms – transmedia – is the future. 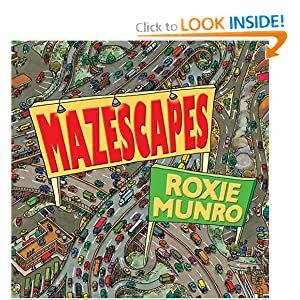 Roxie Munro is the author/illustrator of more than 35 books for children (including Mazescapes; Amazement Park; the Inside-Outside Books: New York City [New York Times Best Illustrated Award], Washington DC, Texas, London, Paris, and Libraries; Doors; Gargoyles, Girders & Glass Houses; Ranch; Wild West Trail Ride Maze; Circus; Mazeways: A to Z; Go!Go!Go! ; and Inside-Outside Dinosaurs). Her books have been translated into French, Italian, Dutch, Chinese, and Japanese. Recent books: EcoMazes: 12 Earth Adventures (Starred Review /School Library Journal; Smithsonian’s Best Science Book for Children); Desert Days, Desert Nights; Hatch! (Outstanding Science Trade Book, NSTA & CBC; Society of International Librarians Honor Award; Bank St College Best Books of 2012, w/Outstanding Merit); and Busy Builders. Recent apps: “Roxie’s a-MAZE-ing Vacation Adventure,” an interactive game app, and the 3-D app, “Roxie’s DOORS.” Roxie Munro studied at the University of Maryland, the Maryland Institute College of Art (Baltimore), earned a BFA in Painting from the University of Hawaii, attended graduate school at Ohio University (Athens), and received a Yaddo Fellowship in Painting. Her art is exhibited widely in the US in galleries and museums and is in numerous private, public, and corporate collections. Roxie lectures in museums, schools, conferences, and teaches workshops. Her skylighted loft studio is Long Island City, New York, just across the East River from her home in mid-Manhattan. Roxie is married to the Swedish writer/photographer, Bo Zaunders. Bo, who has written four award-winning children’s books and illustrated two, has his own children’s app just out: “The Artist Mortimer” (The Artist Who Stole Bits of the World), created by OCG Studios DYO (Develop Your Own) Framework for iOS (iPad and iPhone/iTouch) and Android. (How it was made: “The Artist Mortimer”).